We consider WordPress to be the best blog and content management system as of today. WordPress is widely used across the world and is the most chosen CMS by many. We simply enjoy working with WordPress and continuously develop new features and ways to use it. We can install WordPress on your server or hosting plan and configure it to match your requirements, and then install your choice of themes, plugins, and more. We can take any theme from the thousands available out there and if the license permits it, we can tweak and modify it according to your own preferences. Theme customization includes addition of static pages, selective content fetching, changing colors and replacing the default graphics with your own. A look is worth a thousand words. Differentiate your self from the competition with a unique WordPress theme. We can design your private own WordPress theme, that will deliver the right message to your audience. 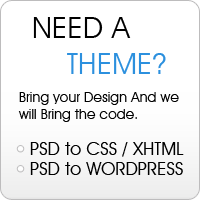 We will take your PSD / jpeg / png / xhtml files and make a WordPress theme out of them. Get better results by placing your site higher on the search engines results pages. With our SEO Power Pack we can guarantee a drastic improvement in your search engine incoming traffic. WordPress is a powerful application. Plugins make it even more powerful! We know the WordPress code inside out and can develop plugins and add-ons that enhance WordPress functionality to match your requirements. We can go as far as your imagination can go with plugins. Sometimes things just go wrong. Your design is broken? Something is not functioning right? We have experience with all sorts of WordPress problems and know how to fix them quickly. We will do our best to have you back online ASAP. We can back up your blog content and configuration so incase something goes wrong we can restore everything and get you back online quickly. Tell us what you need and we’ll find a way to get it for you.